The Diefenbunker was designated a National Historic Site in 1994, due to its significance as Canada’s most important Cold War history site, and its unique construction. When the Department of National Defense decommissioned Canadian Forces Station (CFS) Carp in the same year, the building was stripped of its furnishings, machinery, and all moveable objects. The empty building was then sold to the Township of West Carleton. The volunteers from the village of Carp began to give tours of the Diefenbunker in 1995 and 1996, in order to raise funds for a new community library, to be built in one of the Diefenbunker’s exterior buildings. The tours were a huge success, and drew in thousands of people over the first few days. A group of volunteers formed the Diefenbunker Development Group in 1997 to discuss the possibility of preserving the building and opening a Cold War museum on site. 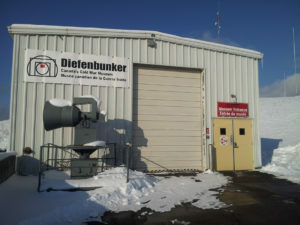 With the dedication of a group of volunteers, many of whom were former employees of the bunker, the Diefenbunker incorporated as Diefenbunker: Canada’s Cold War Museum in 1997, a private, non-profit and registered charity. In 1998, the Diefenbunker Museum was open to the public year-round, operated entirely by volunteers. The mandate of the Diefenbunker is to increase throughout Canada and the world, interest in and a critical understanding of the Cold War, by preserving the Diefenbunker as a national historic site, and operating a Cold War Museum. In 2010, the Diefenbunker underwent a massive capital campaign to retrofit the building’s fire systems. Because of the unique design of the building, fire code had limited it to a capacity of 60 people. After the building retrofit, the Diefenbunker was able to increase its capacity to 460 people. At this point, the Museum began to offer self-guided tours, audio guides, large events, rentals, and increased operating hours. The Diefenbunker is still a private, non-profit and a registered charity, with a team of over 50 dedicated volunteers. It is operated year-round by a full-time staff of eight, and a governing Board of Directors. The Museum is a member of the Ottawa Museum Network, the Ontario Museum Association, and the Canadian Museums Association. The Diefenbunker: Canada’s Cold War Museum gratefully acknowledges the support of the dedicated founding volunteers, without whom it would not exist: Gail Baird, Doug Beaton, Bill Birrell, Bob Borden, Barry Bruce, Carol Bruce, Larry Claus, Louise Fox, Jon Higginson-Lavoie, Connie Higginson-Murray, Katherine Hollinsworth, Jonathan Horwitz, Brian Jeffrey, Bill McKay, Wendy McKay, Doug McNab, Glenn Montgomery, Anne Musca, Wendy O’Keefe, Dave Peters, Pierre Remillard, Beth Sweetnam, Robin Sully, Dixie Trenholm, Locksey Trenholm, and many, many more.